In the powerful and heartwarming conclusion to her bestselling Lowcountry Summer trilogy, New York Times author Mary Alice Monroe brings her readers back to the charm and sultry beauty of Sullivan’s Island, South Carolina, to reveal how the pull of family bonds and true love is as strong and steady as the tides. It is summer’s end and Sea Breeze, the family’s beloved estate on Sullivan’s Island, must be sold. It is an emotional time of transition as Mamaw and the three sisters each must face loss and find a new place in the world. Harper, the youngest sister, arrived at Sea Breeze intending to stay only a weekend, but a rift with her wealthy, influential mother left her without direction or a home. During this remarkable summer, free from her mother’s tyranny and with the help of her half sisters, Harper discovered her talents and independent spirit. But summer is ending, and the fate of Sea Breeze hinges on Harper’s courage to decide the course of her own life. To do so she must release her insecurities and recognize her newfound strengths. She must accept love fully into her life—the love of Mamaw, Carson, and Dora, the love of Sea Breeze and the lowcountry, and most of all, the love of a Wounded Warrior who has claimed her heart. 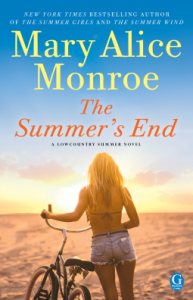 The third book in Mary Alice Monroe’s trilogy that brims with “stories that touch the mind and heart of her readers” (Huffington Post), The Summer’s End follows three half sisters bound by love for their grandmother and the timeless beauty and traditions of the lowcountry. I’ve loved Mary Alice Monroe’s work, and especially her Lowcountry stories, for years, so it was with some sadness that I cracked open my Kindle to read this novel. That sadness was misplaced, because this was the perfect conclusion to the story – the family has to deal with communal loss in the form of their Sullivan’s Island house being sold, and personal loss in their own lives, but ultimately they learn that the house, while full of memories, is only a structure, a framework within which the family existed for a time. The love and connection they have is not dependent on the house at all. As always, Monroe’s characters are given dimensional personalities, distinct voices, and individual arcs of growth and understanding. She writes the sisters, especially, in a way that makes their relationship obvious, but their separate identities equally so. If you, like me, are addicted to stories that take place on Sullivan’s Island, or beach books in general, you will treasure this novel. Yes, I’m a little sad about the end of the series, but Monroe gave us a satisfying conclusion, and ultimately, a message of hope. Goes well with grilled chicken, tomato salad, and cold chardonnay, eaten on the deck.